Invest for Success is understandable and useable. It’s designed to teach you all you need to know about stocks. This does not mean the course content is basic – far from it. We have distilled the most critical information from our 30+ years of experience in the stock market. We have gleaned and tweaked our lessons through good and bad times. This course is jammed packed with the kind of practical information you can use immediately. We have removed all the fluff that fills many other courses. Instead you get rich, step by step and relevant information, key to your success. We are committed to you getting great value. Our class sizes are small so you get the attention you require need in a supportive learning environment. No previous experience is required. This course is suited to both novices and experienced investors seeking better education. If you have gaps in your knowledge, this course is ideal. We teach clear rules for maximising safety in the markets. How to identify good, healthy growing stocks worthy of investment using ‘fundamental analysis’. Knowing trends and when they are changing will optimise your timing. This use of ‘technical analysis’ will give you an edge in the markets. 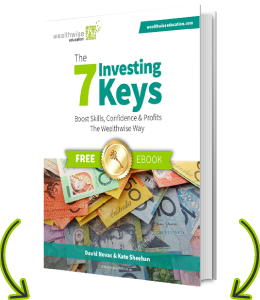 By understanding the Wealthwise Sweet Spot, you will gain the confidence and strategies to profit via capital gains and passive income. In our signature training seminar, you’ll learn how to invest wisely in healthy companies for passive income and capital growth! In this course, you'll learn about options (ETOs) and how to use them for creating additional income and protecting your portfolio. After registering, please wait for Wealthwise Education to confirm by email the venue details prior to booking flights and accommodation. All changes to registrations must be received in writing. Should you be unable to attend, an appropriate substitute attendee is always welcome. Deposits are non-refundable. >= 21 days prior to the event, 80% of invoiced tuition will be refunded. < 21 days prior to the event, 50% of invoiced tuition will be refunded. Attendees who are not satisfied by 12.30pm on Day 1, need just hand in their workshop manual to qualify for 80% of the tuition to be refunded. 'Super Traders' week long workshop is an excellent way to increase confidence and experience in taking trades and repairing them to minimise risk in the event your view of the market changes. All this in a supported and supportive environment with like minded people. 'Advanced Options Trading' is an awesome Wealthwise course. Thanks David & Kate for your generosity and patience in teaching me a formidable tool set for trading options. I knew very little about the stock market before attending the 'Invest for Success' course. I found the course excellent for improving my skills and knowledge. It was straight forward and easy to understand. I now have a new view of the stock market and increased confidence to invest in shares. Attending 'Advanced Option Trading' was a great opportunity to learn from option experts. Experts in the field but also great teachers. These two skill sets don't always go together. A unique opportunity - unmissable! I got outside my chaotic, noisy head into an organised, systematic and easy to follow Wealthwise methodology. Great for busy people like me. 'Invest for Success' is fantastic to build knowledge & confidence. It has saved me years of working out a lot of things ... a light bulb moment! David is a great teacher who is very generous with his knowledge. He is always happy to help with questions. Enjoy catching up each time and will be back again! Invest for Success’ is the first step towards understanding a company’s financial position in relation to its share price. The skills learnt in the course will allow you to find good value in the market place. Excellent! Understanding the fundamentals of a stock also helps me to better trade the charts. Excellent day spent with an expert who can demonstrate how to find value. With this knowledge it is now up to me to do the research, but now with a better understanding on finding value. Today reminded me why this is important knowledge – I want my life back and to be in control!